Last night I voiced an opinion to my husband that differed from his. My comment seemed innocent and innocuous to me, but it tripped an insecurity in him and his response rebound into me, putting my defenses on alert. The ripple effect mounded up and suddenly we were both hot messy mountains of hurt. Intellectually, I know that we don’t all see things the same way. Yet when this fact comes to roost close at hand, with family or friends I think I know and understand, I can get twisted up in a hurry. 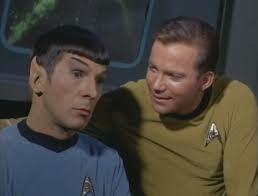 Which might be why I’ve had a peculiar urge today to watch some old television, the original Star Trek to be specific. Geeky and really dated, right? Star Trek is the show I recall watching regularly in my childhood days. And here was a desire to travel and adventure with my old friends. What was this about? Reflecting on this, I’ve realized it’s about wanting to connect with love in those hot messy mountains of hurt. From my subconscious arose the image of two unlikely compatriots: Captain Kirk, impulsive, brash, charismatic and daring, and his perfect foil, Mr. Spock, the impassive Vulcan, logical and scientific to-the-enth degree. Just picturing these two characters that I’d idolized and adored made me smile. I thought about how they respected one another’s uniqueness and created a friendship that expanded both their lives. They forged an alliance that benefited their entire fellow crew. In the world that they faced together, with overwhelming odds stacked against them repeatedly, nothing seemed impossible. I know. It’s tv. But, these two characters imprinted on me some hallmarks of deep and true friendship — the ability to be authentic to myself and also genuinely support differences in another person. It isn’t easy. My family of origin emphasized right or wrong, one or the other, winning the argument. Except no one really seemed to win. I certainly never felt good ‘winning’. Exploring the gray zone in the middle is the place where relationships find and forge their mettle. When I consider how we each experience life uniquely and filter it within the context of our singular hearts and minds, not agreeing actually seems more likely than consensus. But I’m wired for tribal loyalty, genetically coded to bias toward likeness. I have to remind myself that I and the world are both better served by pooling thoughts, creativity, skills. Like Captain Kirk and Mr. Spock. It’s a tall order to accept my own worth enough that I don’t need the bolstering of congruence. When push comes to shove, I frequently fail at this. However, there are moments, tiny flickering moments, when I recall love. The love that is everywhere. The love I want to have for this person. The love that is a beacon to a better outcome. Within those moments, I lay down tactical advantages and instead spot the opening where I can listen better and find a bridge. As I increase my connection to my values of loving and growing, these moments become more prevalent and more compelling. But at times, I still wind up in that place where all the artillery has been used and no one is left standing. And still, love is the answer. It’s courage and love that can repair the collateral damage. The courage to sort through the fallout and admit my mistakes and misfires, and the love to honor another’s truth as I honor my own. Dynamic friendships are where I literally come face-to-face with some of my greatest vulnerabilities, and largest opportunities to expand understanding. There are all about boldly going were no one has gone before. And letting love power the trek forward. This entry was posted in Connection, Courage, Friendship and tagged Rick Hanson. Bookmark the permalink. I thought this was a wonderful post, Lisa—starting with your hesitations about the differences expressed by you and your husband and the real wish not to let it be a winner take all battle. Then you went back and realized that your childhood never left you (or maybe anyone) feeling good at winning. Finally, you wrote about love as being something to work for, to find in yourself enough to listen to the other person’s ideas and then respond without a battle. This way love has a chance to bring people together instead of their fears and weaknesses pulling them apart. Thank you for your fine writing. I learned a lot. Thank you, Daniel, for this terrific and thoughtful comment. I appreciate how you condensed and solidified my thoughts with your breakdown. You really nailed it! I learned too, and loved this line – ‘This way love has a chance to bring people together instead of their fears and weaknesses pulling them apart.’ Yes! Perfectly put!